Published Aug 12, 2016 By Julia 3 CommentsThis post may contain affiliate links. 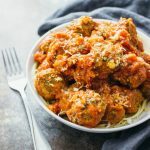 This is an easy and fast recipe for homemade meatballs that do not involve baking nor the crockpot. 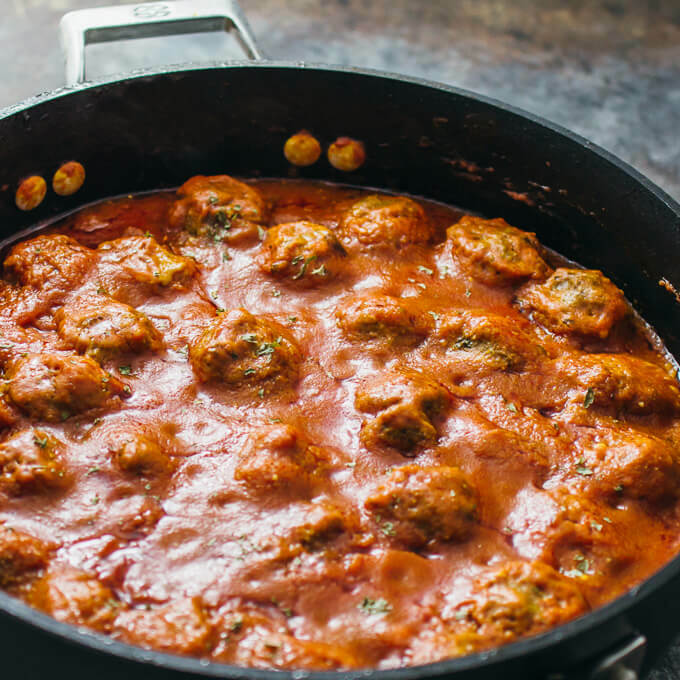 These meatballs are cooked via stovetop simmering in a deliciously hot and spicy chipotle sauce. These meatballs are really tender and soft, and come with a generous heaping of spicy chipotle sauce. The sauce is made from crushed tomatoes, garlic, and herbs like basil and oregano. Yum. So what makes these meatballs so moist and tender? It’s all about the length of cooking — read about the experiment at Serious Eats. When you cook meatballs on the stove, the meatballs finish cooking at around 30 minutes when being simmered in sauce. When you cook meatballs in a slow cooker or crockpot, meatballs take hours to cook and end up being dry and crumbly. 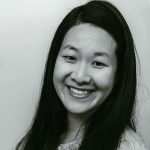 So while it may sound like a great idea to cook meatballs for a really long time in a crockpot, it’s not because the meatballs lose their tenderness. So put away that slow cooker, and take out your favorite pan or pot with a lid! 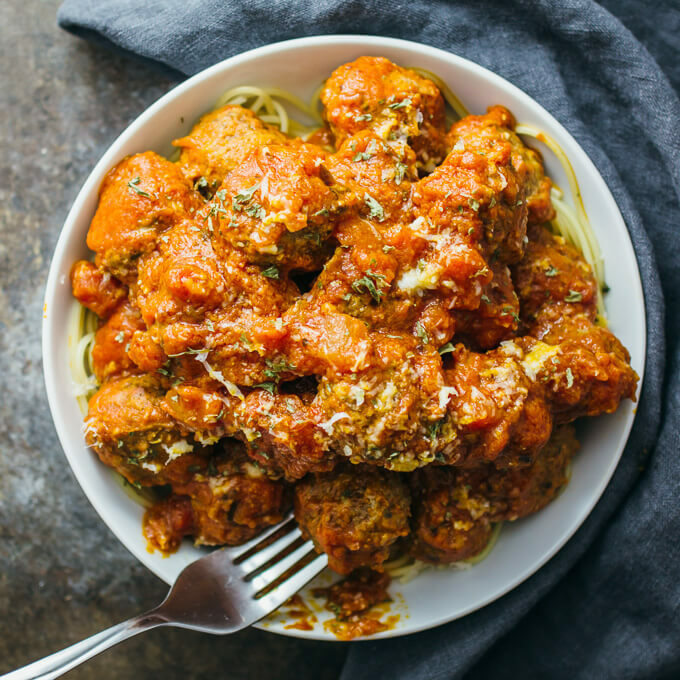 These homemade meatballs definitely remind me of those meatball subs. 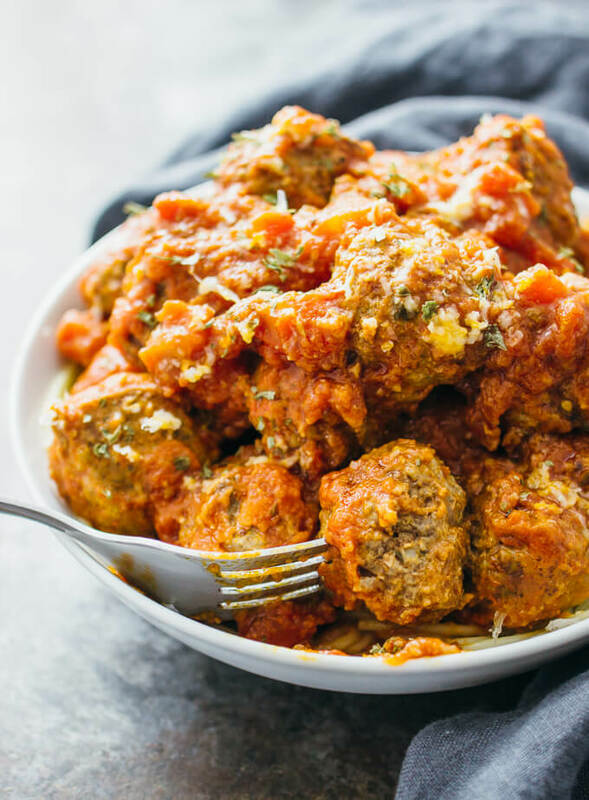 Meatballs are really easy to make at home so I definitely recommend that you try it at least once. 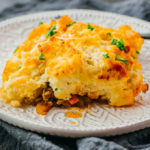 All you need is a good chunk of ground beef (I like the leaner cuts), bread crumbs, cheese, eggs, seasonings, and your favorite herbs. Mix it all together and then form into little 1-inch balls. 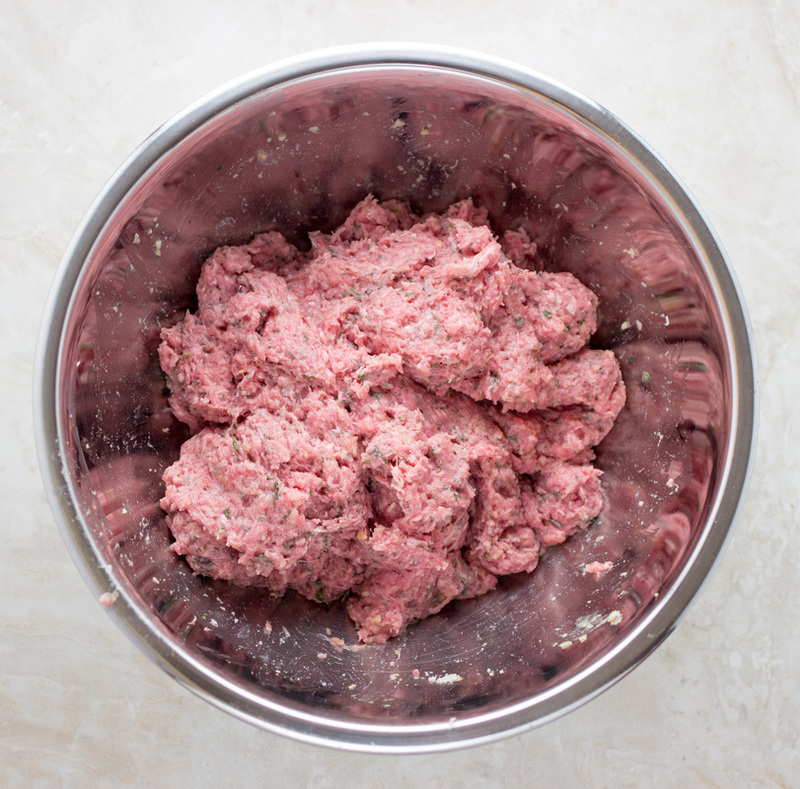 You can make larger meatballs if you like, but they will just take longer to cook. Then I recommend that you place the formed meatballs on a tray so that you can easily slide them into the refrigerator to harden while you work on the sauce. After the sauce is combined and cooking in a pan, I drop the hardened meatballs into the sauce and they simmer with the lid on until they’re cooked. I love how they get coated with that nice orangey chipotle sauce. While you’re waiting for the meatballs to simmer in the sauce, you can think about what you want to pair the meatballs with. I typically cook up some noodles so that I can slather them in the chipotle sauce. Roasted garlic bread with sharp cheddar is also a great idea. 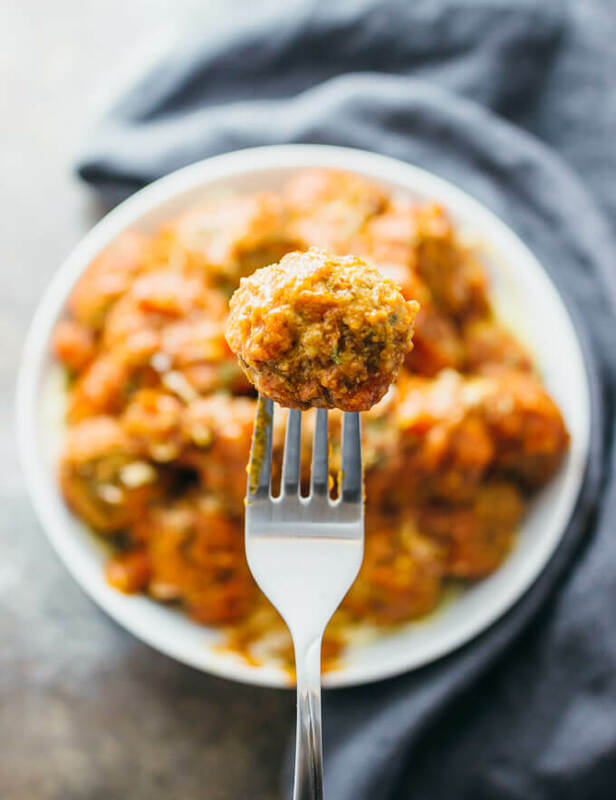 These meatballs are cooked via stovetop simmering in a deliciously hot and spicy chipotle sauce. 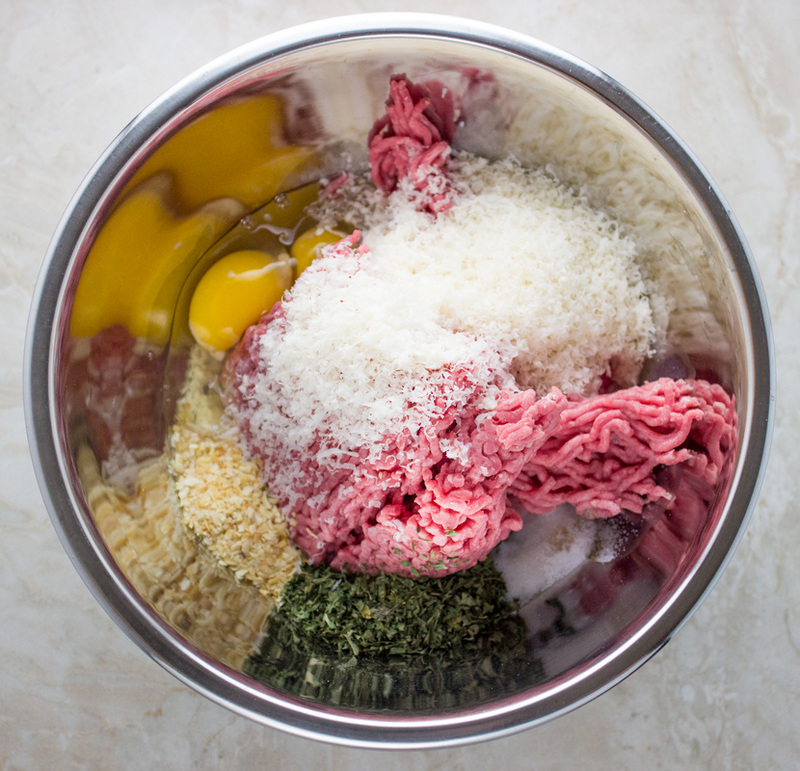 Make the meatballs: Combine meatball ingredients in a mixing bowl. Mix well. 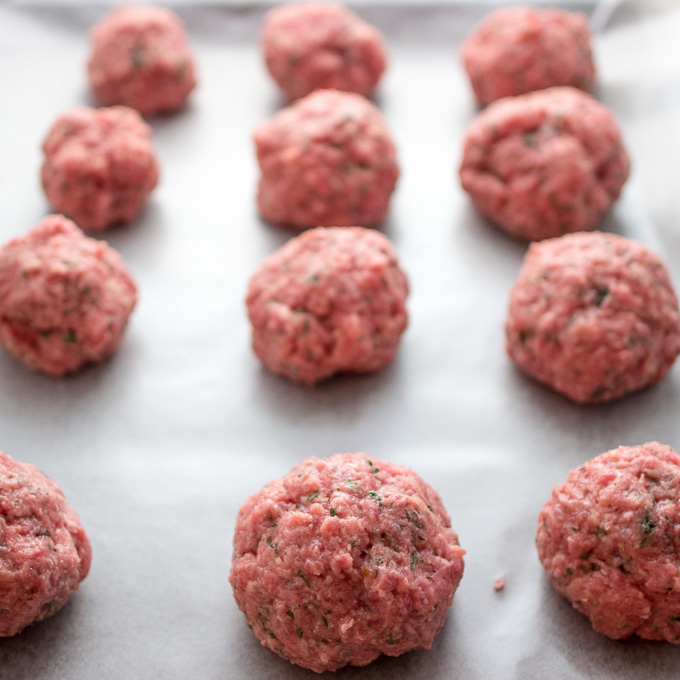 Shape into balls about 1 to 1.5 inches in diameter, resulting in about 30 meatballs. 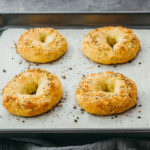 Place them on a tray and refrigerate to harden them a bit (so they keep their shape) while you work on the sauce in the next step. Make the sauce: Heat up olive oil in a pan over medium heat. Add garlic, chipotle, and basil, and let them sauté until the garlic starts browning, about a minute. Then add the tomatoes (including the liquid in the can) and salt. Mix well. Let it simmer for 5 minutes over low-medium heat. Lastly, add mayo and stir well. Simmer the meatballs: Carefully add meatballs to the pan, one at a time. Make sure that each meatball is completely coated with sauce. Cover with a lid and simmer until cooked through, about 30 minutes. Cut one meatball open to verify that they have finished cooking. 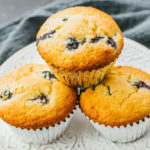 This recipe yields 12.5 g net carbs per serving. I love chipotle sauces and this was great! Any substitutes for the mayo? I’m not a big fan of it, in general. You can try skipping the mayo. It shouldn’t make a big difference in the sauce. Hope that helps!